Notre 244 Eastwood est une belle et spacieuse maison de montagne privée située juste à l'est du centre-ville d'Aspen. Nichée dans un quartier résidentiel calme avec vue sur le mont Aspen, la maison ne manquera pas de vous plaire. Cette retraite de montagne comprend une grande terrasse privée avec une table et des chaises, un bain à remous, un barbecue et des chaises longues. Elle est parfaite pour une soirée d'observation des étoiles. Entouré d’arbres d’Aspen et offrant une vue sur Aspen et le domaine skiable, c’est un endroit merveilleux pour se détendre. Imaginez-vous vous détendre, vous détendre et vous immerger dans l’eau apaisante du bain à remous après une longue journée d’activités. Avec des fenêtres dynamiques de deux étages allant du sol au plafond, à l'est et au sud de la maison, la lumière naturelle abonde. Le salon accueillant, les grandes fenêtres offrant une vue imprenable et le grand foyer à bois en pierre naturelle sur deux étages se marient parfaitement pour faire de cet endroit l'endroit idéal pour l'après-ski. La cuisine complète offre une abondance d'espace de rangement et de comptoir avec un comptoir intégré à quatre brûleurs, une table de cuisson à gaz et un bar. Vous serez certainement le centre d'attention lors de la préparation du festin du jour! Le coin repas séparé offre des sièges supplémentaires avec vue. La maison est conçue avec 4 chambres et 3 salles de bain. La chambre principale a un lit king et salle de bain privée, la deuxième chambre a un lit queen et un jumeau, la troisième chambre a un lit double et la quatrième a deux jumeaux. Les caractéristiques supplémentaires de la maison comprennent des planchers de bois franc, un magnifique concept à aire ouverte, une connexion Internet sans fil, une laveuse et une sécheuse, ainsi que de nombreuses places de stationnement sur place. Il se trouve à proximité d'une ligne de navette et de l'itinéraire «Dial-A-Ride». Vous pourrez ainsi vous rendre rapidement au centre-ville pour faire du shopping de classe mondiale, aller dîner, profiter de la vie nocturne animée, du ski alpin ou de la randonnée / cyclisme de nombreuses autres activités proposées par Aspen. Veuillez noter qu’une unité de gardiens à temps plein est associée à la maison. Appelez-nous et laissez le service clients de McCartney Property Management ouvrir la porte à votre expérience Aspen! Veuillez noter que cet établissement peut autoriser un animal domestique sur approbation et moyennant des frais non remboursables. This property was great for our group of 6, with lots of bedrooms, baths and space. The kitchen was well-equipped, and it was nice and clean. The city bus will pick up and drop off at the door, for an extra one dollar per person - although the walk to town, using the secret shortcut, is quite manageable. While the house is a bit older, it's quite nice & spacious, and I felt that it was fairly priced: for the money (in Aspen), it's definitely five stars. We enjoyed our stay at this home, nestled in a quiet aspen grove just outside of town. We were easily able to walk to town (less than a mile) from the path that leads down from the hot tub. The backyard is great and the family room was perfect for group games. The house had plenty of room for our group and fit our needs well. That said, if you are looking for someplace with up-to-date finishes, high attention to cleanliness, and modern style, then this is probably not the place for you. It was obvious that a deep-clean and some updates seriously needs to take place at this property. There are definitely mice in the house (there was mouse poop in several areas), a rug upstairs had significant mold on it, and there was a general need for renovations throughout the house. This includes things like windows not opening properly, window treatments not functioning, and the deck's paint chipping off so significantly that it was getting tracked all over the house. This house seems to have been used as a party house in the past with little emphasis places on renovations, so make sure the home fits your needs before you rent it. All in all, our group was happy with the accommodations, as we just needed a quiet, peaceful place to get together that had space and was out of town. That said, at a minimum, the mouse problem should be taken care of immediately. I really enjoyed the views and the fireplace from the house! Thank you for providing the wood!! The property mgmt company was a plus and available to help us! They brought over an extra hair dryer and refilled the light propane tank. They were really nice! The house has a modern kitchen and living room area. The hot tub was perfect and worked well for a day after skiing! Grill was great for family meals. We appreciated the humidifiers provided and stored in the closet. We are from Houston so we were not use to the dry air. The humidifiers helped us sleep better. They provided travel size shampoo and conditioners. We used the washer and dryer 2 out of the 3 nights we were there. The rooms were a little older, but we didn't mind for the price and location. We used the dial a ride service. It was so convenient! We were a group of 8 ppl, 4 couples, in our early 30's. We loved our stay!! Shades were broken on lamps and over some of the windows. Handle on one of the showers was loose. Lights didn't work in one of the bathrooms. Deck needed painting and wood will rot if they don't. They don't mention that it backs up to a busy street so you hear the traffic while on the deck...not very peaceful. Other than the traffic it was all things that could be fixed! My group was not pleased at all. Thank you so much for taking the time to write a review. It really helps us to help you if you contact us during your stay to let us know about your concerns. If the guest does not contact us we are unaware of the issues therefore unable to fix the issues. We have a maintenance staff on duty during business hours and on call 24 hours a day. If light bulbs have blown out, door handles need tightening or shades replaced, please let us know. We will send someone over immediately to take correct the issues. The last week of September is the end of our busy summer season. Thank you again for staying with us and for the review. Our maintenance staff will take care of the home. Decent location and within walking distance to town. Nice hot tub and neighborhood. Property had a lot of deferred maintenance and badly needs to be updated. We were also not aware that there is a basement apartment that shares some of the outdoor spaces. 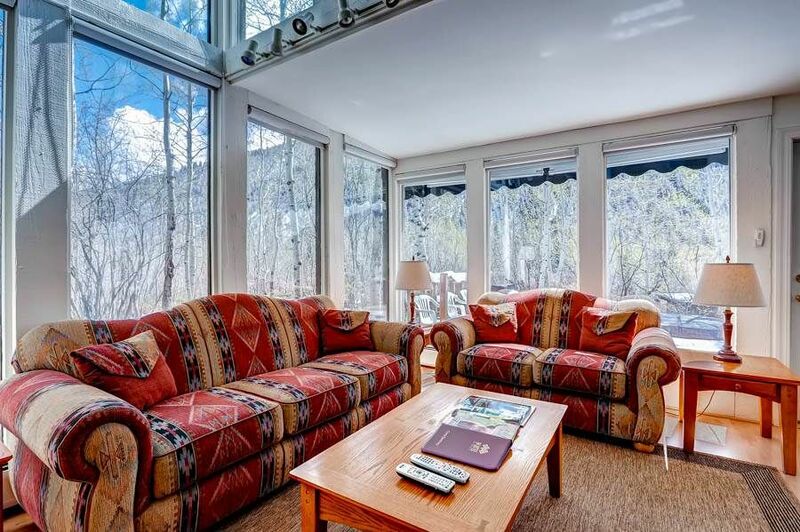 This home is a beautiful property in a lovely neighborhood very close to downtown Aspen. The Dial a Ride service is very convenient pick up service for rides to town or it is a beautiful walk. I would highly recommend this property for families joining together for a summer visit or winter ski trip to the magnificent Aspen area.